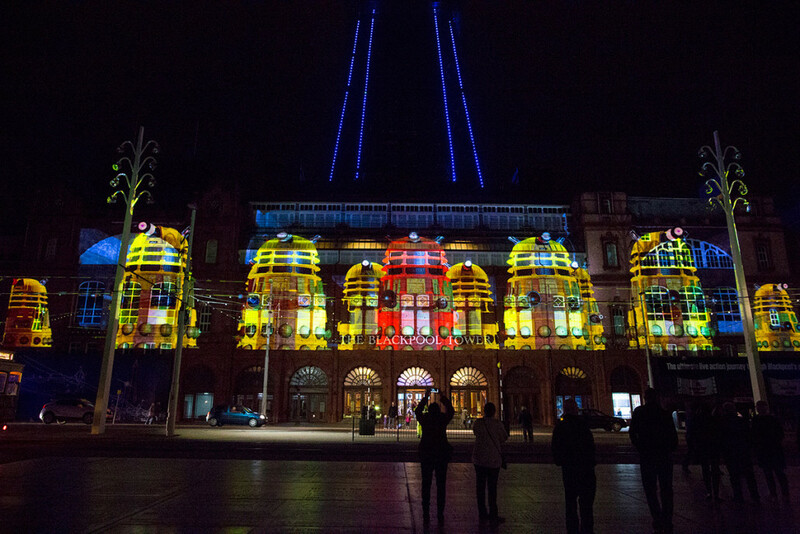 War Productions chooses 14 Panasonic 17,000 lumen projectors for a semi–permanent digital mapping show at Blackpool Tower. 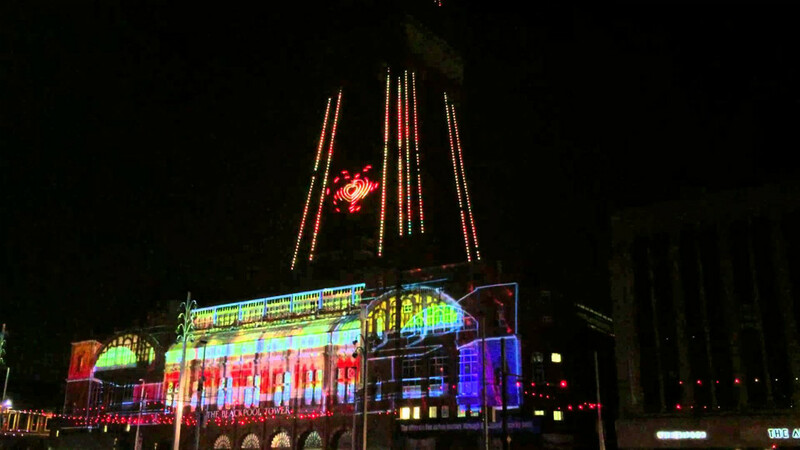 Blackpool is home to the world’s biggest free light show. For nine weeks every autumn, 74 miles of lighting cable adorns the North West town’s six mile seafront from Squires Gate to Red Mile Road. 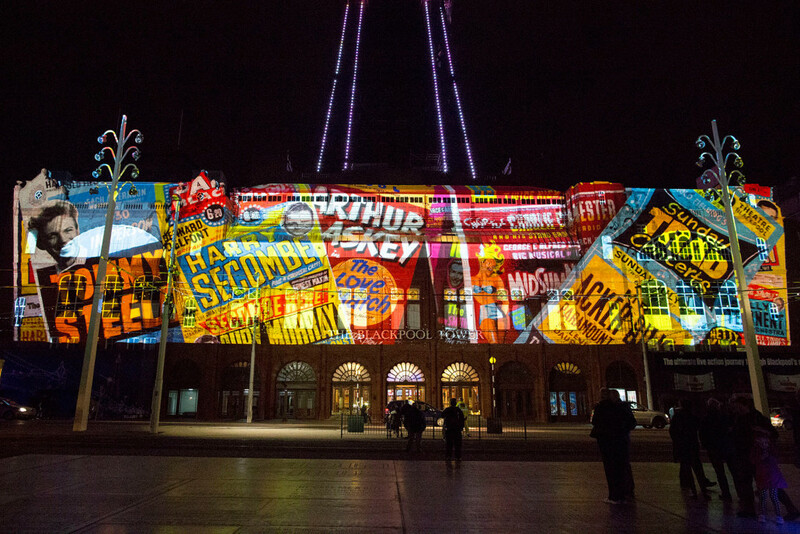 Blackpool is home to the world’s biggest free light show. For nine weeks every autumn, 74 miles of lighting cable adorns the North West town’s six mile seafront from Squires Gate to Red Mile Road. 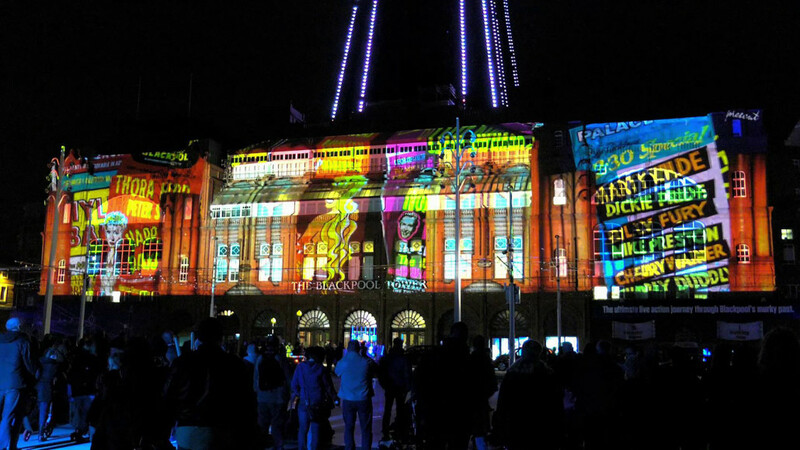 In 2014, 3.5million people visited the Blackpool Illuminations, with many returning year after year. As such, it is important that Blackpool Council keeps the show current and is able to continuously raise the standard. 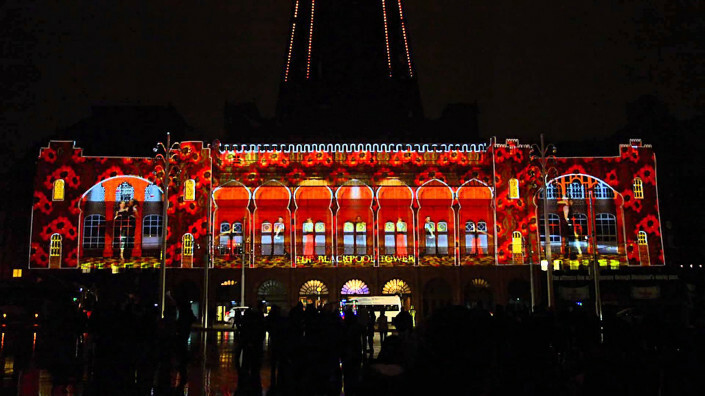 For 2015, the Council was keen to use the latest in digital mapping projection technology to light up the iconic Blackpool Tower Ballroom with content that gave a nod to Blackpool’s history, incorporating its music and iconic imagery. Funded by a £2m grant from the Coastal Communities Fund, along with contributions from Blackpool Council and LeftCoast, War Productions (WarPro) was awarded the contract to produce a projection mapping show that covered the front of the Ballroom, integrated with lighting both on the promenade and on the Tower itself, and which would entertain the family audience Blackpool has always catered for. Integrated with lighting both on the promenade and on the Tower itself, and which would entertain the family audience Blackpool has always catered for. The 11 minute projection mapping brought with it challenges, particular in relation to the location. The level of ambient lighting in the surrounding area, the distance between the building and the projection stack and the amount of street furniture all needed to be taken in to account when designing the installation. It meant that WarPro specified a higher number of projectors (installed vertically in a criss-cross pattern) to ensure that there was no shadowing from the street lights on the building surface. A PNG mask was also added to the content to ensure that the street lights weren’t projected against, which would have been distracting for the audience. War Productions also introduced the hugely popular concept of an interactive i-Booth as part of the Lightpool project that allows visitors to see their faces projected on to the facade of The Tower Ballroom. The system uses an AW-HE2 Panasonic remote camera to capture an image in HD which is then broadcast within three boxes across the building in between the Lightpool shows. Fitted with Multi-output Graphics Cards and running Dataton Watchout 6. 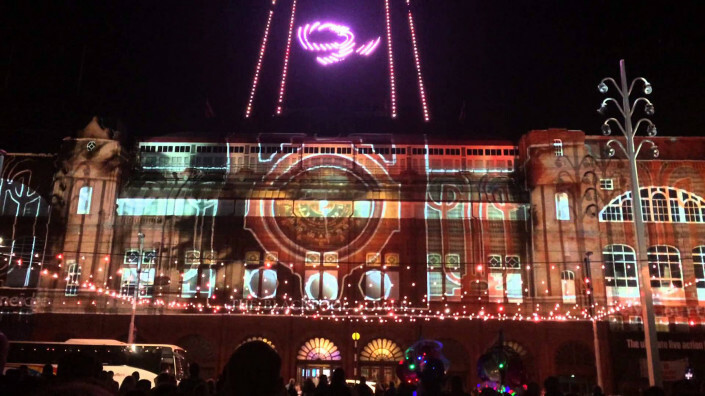 We provided projection services for a 5 week run 2015/16. 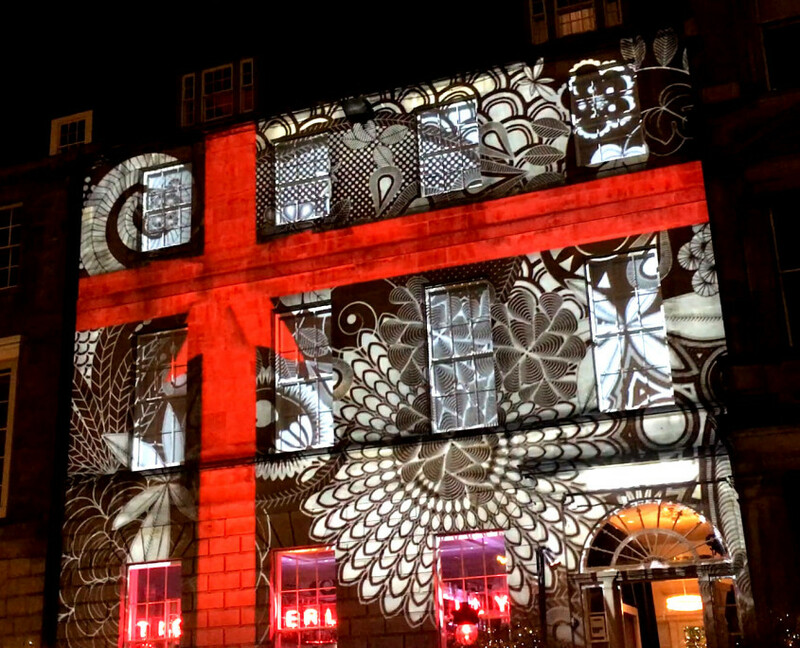 Tigerlily is one of Edinburgh’s top bar/restaurants with boutique hotel on the upper floors. Based in a converted Georgian townhouse in Edinburgh’s Historic George Street. We were contracted by them to design and deliver an original projection show which was turned around in an incredibly short timeframe.